New York City, N.Y., Nov. 13, 2018 – In 2006, when Christy Gardner was serving in the U.S. Army military police, she suffered a brain and spinal cord injury that left her with speech and memory damage, and no feeling below her knees. Ever determined, Gardner spent years in recovery, and in 2015, made the decision to have her legs amputated below-the-knee, in hopes that she could be more active again. Gardner hasn't slowed down since, using custom-designed prosthetic legs to walk, hike, sprint, surf and more. Her mother says, "Losing her legs saved her life. It was like I got my daughter back." 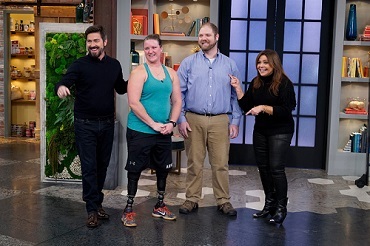 On Nov. 9, Gardner appeared on the Rachael Ray show to share her incredible story before Veterans Day 2018, along with one wish: to have prosthetic feet with adjustable ankles, which would allow her to wear shoes with a higher heel. Watch the segment below to see how Rachael Ray teamed up with Gardner's Auburn, Maine-based Hanger Clinic prosthetist Rick Browning, and manufacturing partner Freedom Innovations, to make Gardner's dream a reality.